When the nonpartisan Congressional Budget Office released its worst-than-expected estimate just after 4 p.m. that 24 million people would lose coverage under Trumpcare in 10 years (14 million next year), Axios' David Nather accompanied his flash post with a GIF of a mushroom cloud. 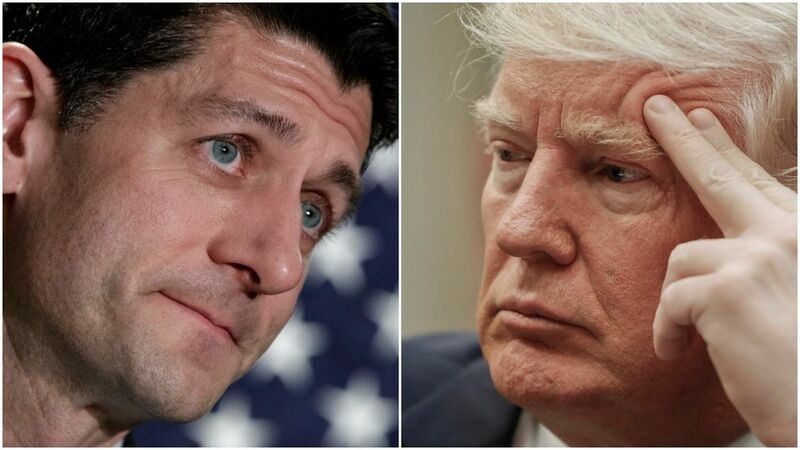 Breitbart had a bomb of its own that Paul Ryan opponents had been husbanding for months, waiting to detonate at a time of maximum vulnerability: audio of the Speaker on Oct. 10, a few days after the release of the Billy Bush tape, saying on a conference call with House Republicans: "I am not going to defend Donald Trump — not now, not in the future." His remarks had been reported at the time, but now the tape was out there. For Republicans on both ends of Pennsylvania Avenue, it was the coup de grâce on a downer day. House GOP leadership soldiered on, saying that members are "by and large in a good place" despite the "coverage gap": "[T]he score was better than expected on premiums [down 10% over 10 years], deficit reduction, tax relief." Ryan said he was "encouraged"! Aides said leadership plans to send the "well-crafted plan" — mostly as-is — to the floor for final passage by the end of next week. That theoretically would allow the Senate to hit the target of passing it before Easter break, along with the confirmation of Judge Neil Gorsuch to the Supreme Court. But the CBO's headline number added huge uncertainty, and mammoth new risk for Republicans. The N.Y. Times' David Leonhardt called it "jaw-dropping." A Democrat who knows the Hill well emailed us: "Paul Ryan can kiss his AHCA [American Health Care Act] good-bye." Nather writes this morning in "Trumpcare and the CBO freakout" that his bottom line summed up in this tweet from former Senate Republican aide Rodney Whitlock: "Critical, soul searching moment for GOP. Ignore #CBOscore and plow ahead or admit that some ideas might just be problematic." A theory from one Republican lobbyist: "Trump throws Ryan under the bus. Negotiates a deal and they pass it." Another counters: "More likely Trump gets Ryan to make changes but has to campaign to help get the votes in the House." Either way, the House R optimism is based on policy, and now we're in the realm of politics. Our experts expect some transition tweak to soften the blow.